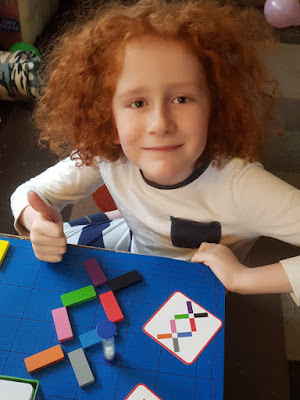 The Green Board Game Company make inclusive games that you can play together, whatever your ability or age. They encourage brain power and build skills such as memory and vocabulary, but don't ask for hours of commitment and concentration. Most of all though, they're fun. Green Board Games sent us 3 of their most popular games to review: Visual-memory game Shaperise, one of the original BrainBox games - BrainBox Roald Dahl and the very different and creative Re,Cycle,Me. 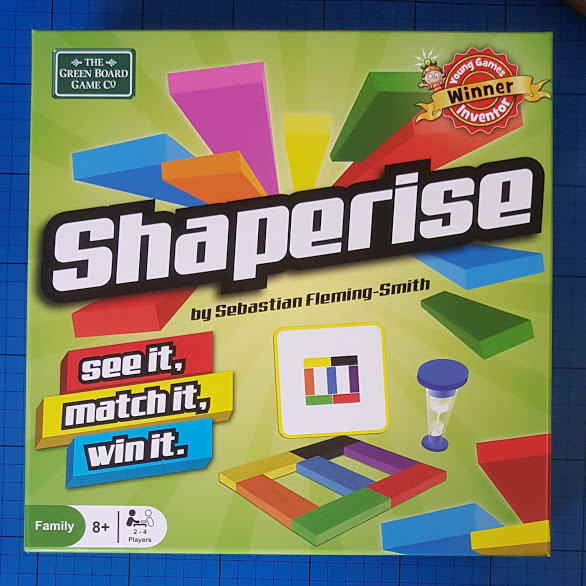 The first game we tried was Shaperise, rrp £15. This was the winning game in the Young Games Inventor Of The Year Competition 2016 and was designed by 11 year old Sebastian Fleming-Smith. Suitable for age 8+ and 2 players, younger children can join in non-competitively and it's great for hand-eye co-ordination, concentration and even learning colours. Everything comes in a neat cardboard box which can be used for storage afterwards. 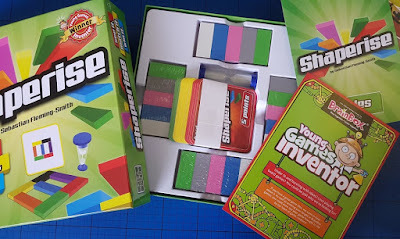 There are 40 coloured blocks, a timer, instructions and 60 different Shaperise Cards. 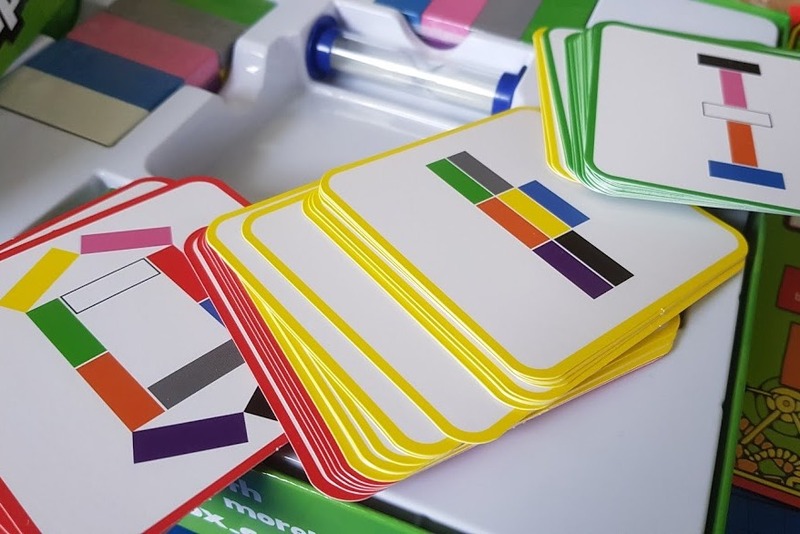 The cards are in 3 levels of difficulty and each show a design that you have to copy using the blocks. Instantly we spotted an issue because 3 of my boys are colourblind. We made it clear that as long as we know which colours they can't distinguish before we start, they'll never be penalised for those errors. Mainly it's the red and green blocks themselves which they can't tell apart. Shaperise sounds ridiculously simple, but it's really hard once the pressure is on. There are 5 suggested games in the instructions, all a variation on 'look and copy'. The hardest by far is to look at the card, remove it and then try to recreate the pattern. None of us have managed one of these yet beyond Easy Level! Shaperise is a really nice game to play with and the blocks are very attractive. Some of the designs are actually very beautiful and anyone can play on an even level, whatever age you are. BrainBox Roald Dahl, rrp £11.99 is one of the classic BrainBox memory games and features 3 of his best-loved books - Matilda, The BFG and Charlie & The Chocolate Factory. Suitable for age 7+ and 1 or more players, this is another game that should appeal to the whole family. Stored in a neat little box, it's brilliant for travel and takes up very little room on the shelf. 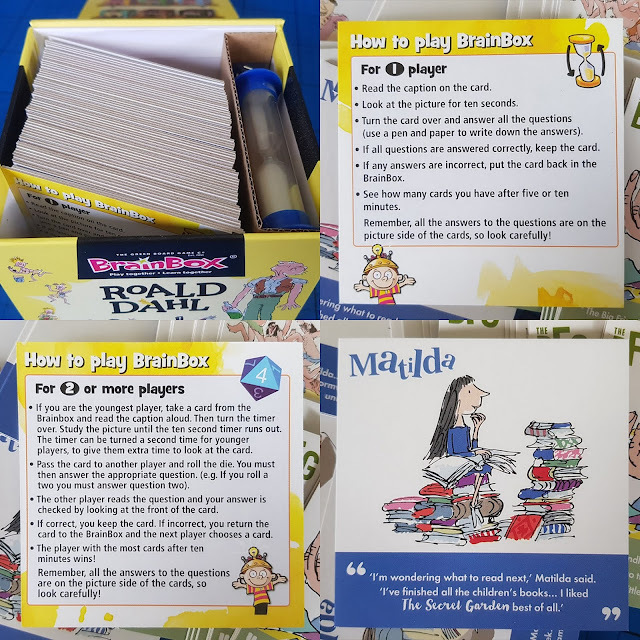 Inside we have a timer and an 8 sided dice, a rules card and 55 BrainBox Cards. Each BrainBox Card has an image and quote from the book on one side, and 8 questions on the reverse. The questions aren't hard at all - if you can see the accompanying image and quote. 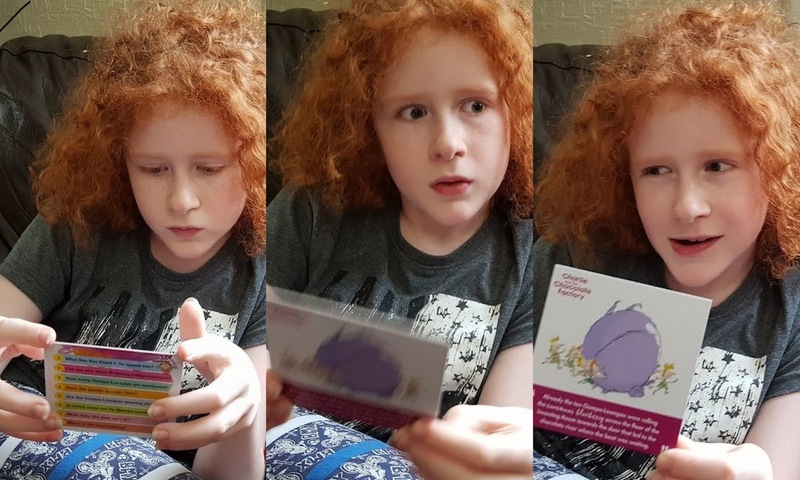 Remembering the answers when you can no longer see the card is another thing though! 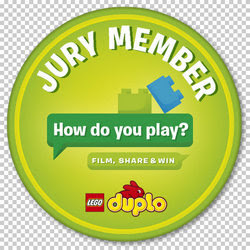 There are two suggested ways to play, either solo or competitively and both are loads of fun - and quite frantic! It's clear to see there are several other possibilities and you can easily adapt the rules to suit the ability of your players. I like competitively answering as many questions as possible within the time limit. 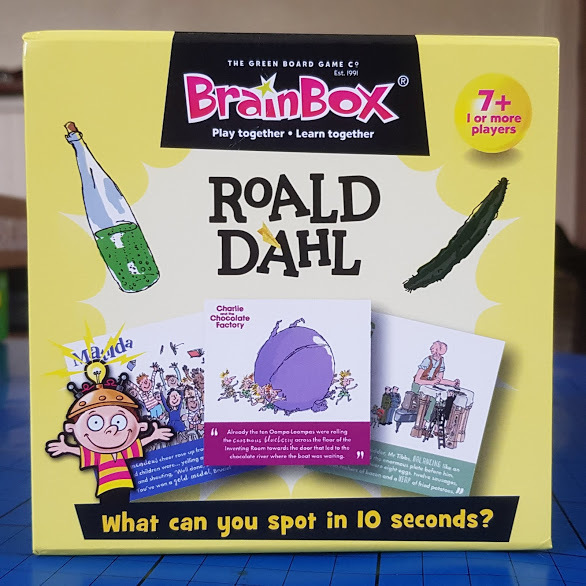 BrainBox is a great game for all members of the family and available is many different versions, from Peppa Pig and Animal Families to Myths & Monsters or World History. You can really learn a lot without even trying and they are addictively competitive! 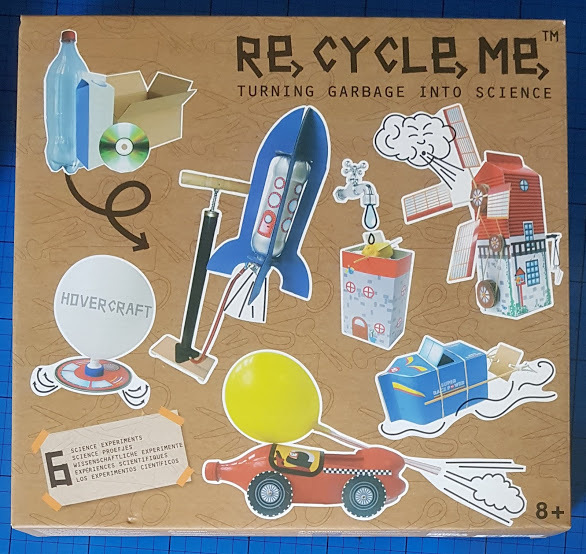 The last item we were sent is the Re,Cycle,Me Science Experiments set (age 4+), rrp £14.99 (Amazon affiliate link*). 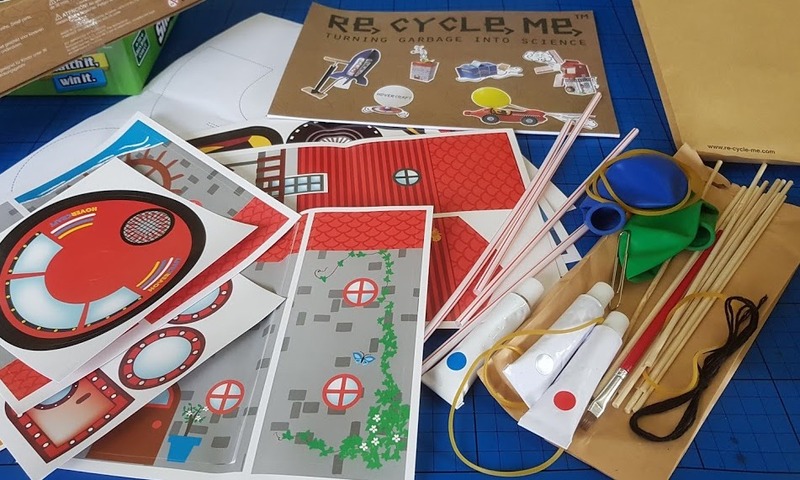 Not so much a game as an ingenious way to teach children about reusing and recycling. 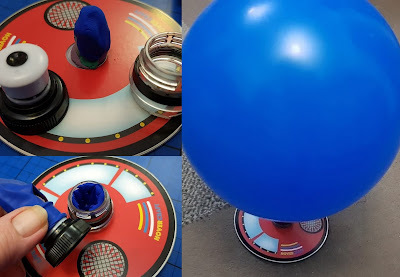 Suitable for age 4+ with some help, the contents of the kit, added together with some of your recycling, can make a whole host of toys which are also air and wind power science experiments. Inside the box is a brown paper bag, and inside that a load of stickers and templates and another small paper bag with elastic bands, straws and balloons, paint and all kinds of exciting things. The contents of the box, plus your rubbish (and a potato) can be used to make a moving racing car, a flying rocket, a windmill that turns in the wind, a powered boat, a hovercraft and a water wheel. We haven't had a lot of time yet, so we haven't been able to make full use of this set, but when we do I'll share the photos on Instagram. 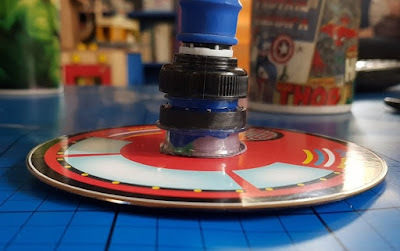 We have had a go at the Hovercraft - although ours only momentarily raises from the ground and can't really be moved at all, so we need to discover what we need to change to create more sustained lift. It's not failure, it's science! 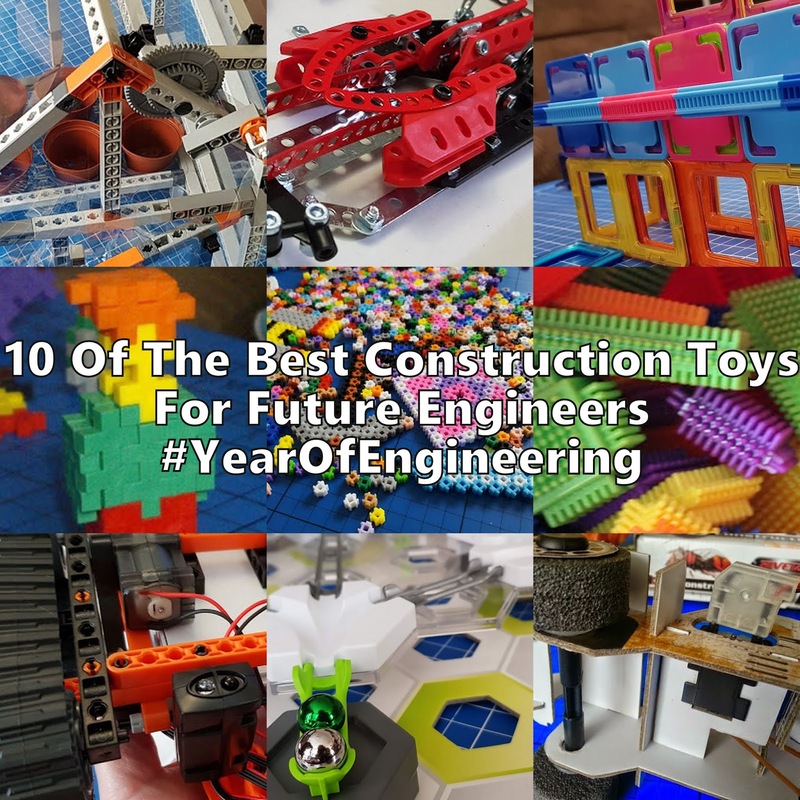 These are all projects that children can be proud of, but they also teach important scientific principles and concepts such as friction, creation of energy using water or air, engineering and design, basic physics, gravity. The list is massive. There are several Re,Cycle,Me sets available including themed boxes to match holiday seasons, musical instruments, pirates and princesses. There are even party boxes for several children. 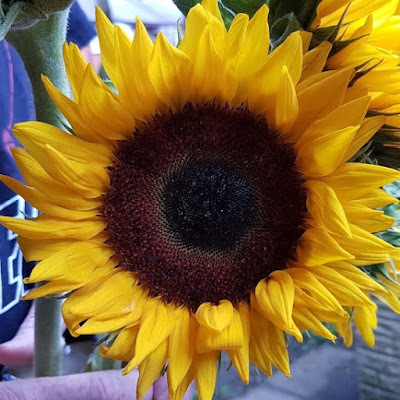 Prices vary from around £9-£20. 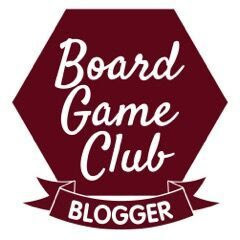 I'm a big fan of The Green Board Game Company. 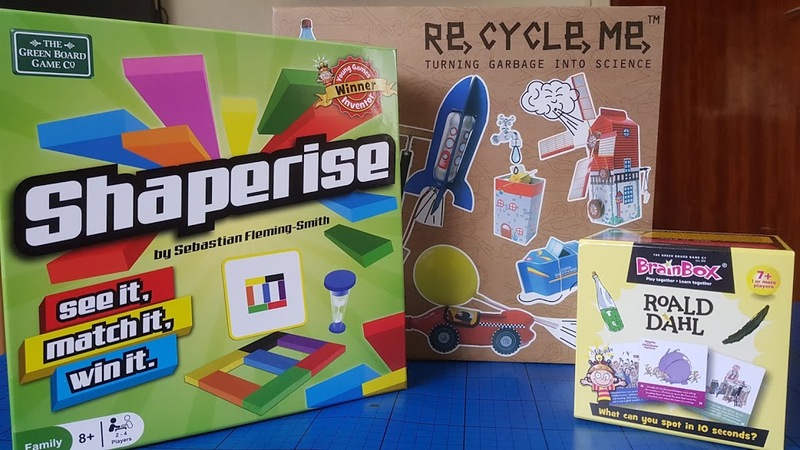 Their ethos is great, with educational toys for age 4-11 which are great fun to play, use recycled materials and promote sustainability and responsibility. 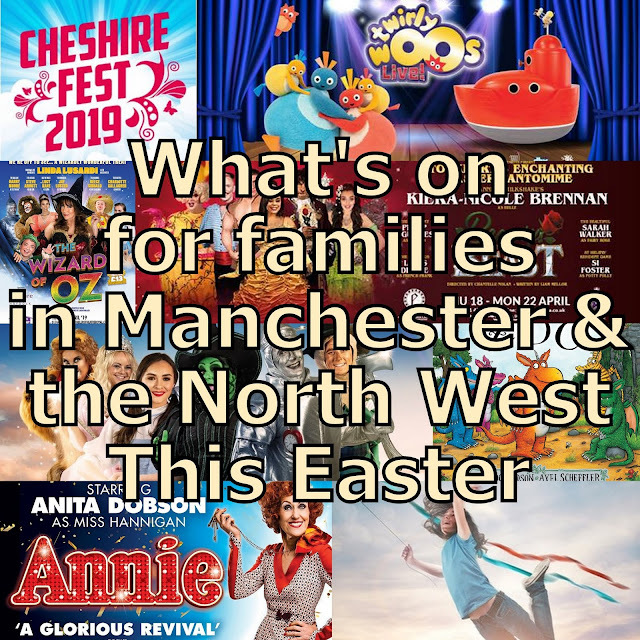 They are really keen on inclusion and all of their products stretch understanding and skill, but can be adapted to suit different ability levels and are great for multi-generational play. 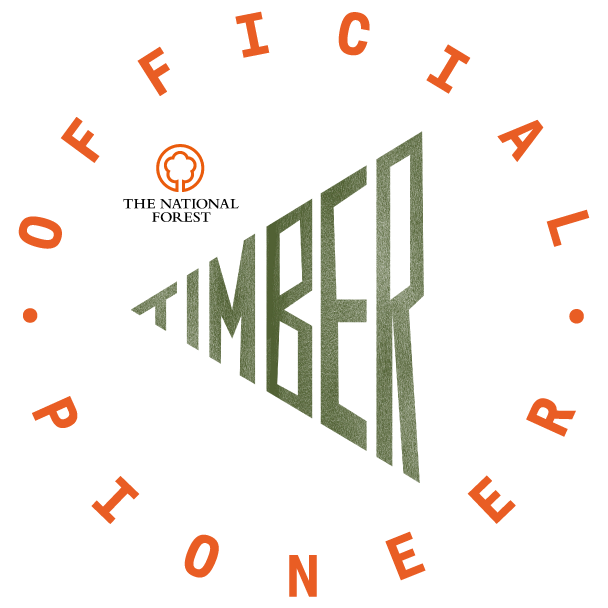 You can find out more on The Green Board Game Company website. We were sent our sets and games for review. Amazon links are affiliate links which means that if you order through my link, I will earn a few pence, but you won't pay any more.